The free, downloadable NSCAD Mobile App provides easy access to emergency phone numbers, including NSCAD security. It also has numbers for student wellness services such as academic counselling, mental health support and disability services. The App also allows the university to communicate directly with users via a bulletin. Scenarios could be stormy weather that makes travel to class unsafe or a power outage at one of the campuses. 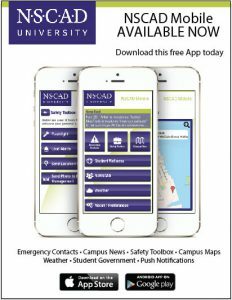 Other features of the app include a news feed from Twitter, a map of Halifax showing campus locations, and tools such as a handy flashlight and loud alarm.